The current trend is to make a resume that is different from all the others out there. One way to do that can be with a template that incorporates a photograph. The photo does not necessarily have to be a picture of you that may not be an appropriate strategy for your industry. It could be a picture of a building you designed, a piece of artwork you created or something as simple as a monogram, which is a feature that is built into our system. If you are interested in using a monogram you can choose one from the "Add a Logo or Photo" page in the creator. For an artist or an engineer this can be an effective method of displaying an example of your work. It is a small example, but it still gives you another opportunity to get your work in front of the employer yet another time. Being out in front of the pack is important when trying to get a job, employers usually get loads of applicants. What are you going to do to get yourself noticed? Maybe having a resume with a photo might do the trick. 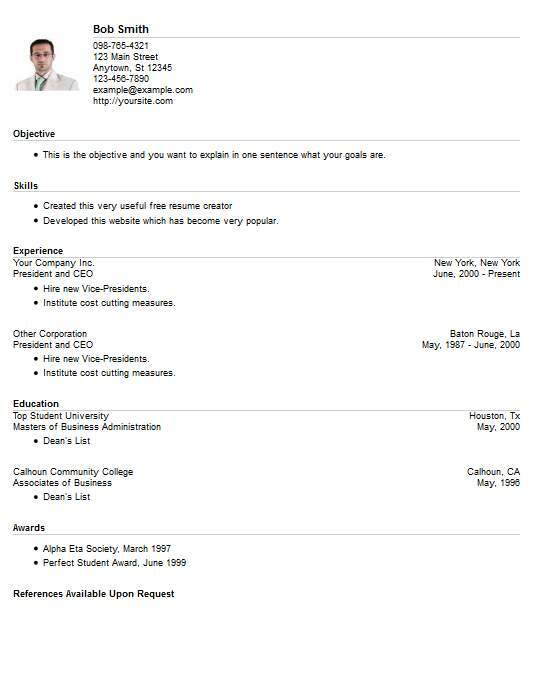 If you like this idea you can get this template from our creator program, create a resume for free, then at the end export it. And no you don't have to pay us for it! To further assist you we welcome you to browse our library of tutorials. You can read more about using a logo on your resume, how to write a resume correctly, even how to apply for a job. Our wish is that these materials will be helpful and provide you with a shortcut to getting a job. Make the best of what you have or go out and get some additional skills to make yourself more valuable in the workplace. Maybe this template is a good place to start.